There are two awesome holiday experiences in Disneyland Resort that are not to be missed this year. Nope, I’m not talking about the homemade candy canes or the yule log (though both of those are definitely not-to-be-missed! 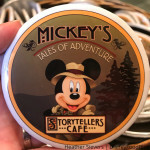 ), I’m talking about visiting Santa’s Cabin at Big Thunder Ranch in Disneyland and visiting the gingerbread house at Storytellers Cafe in Disney’s Grand Californian Resort! Every year my family visits Santa at his Disneyland home away from the North Pole. 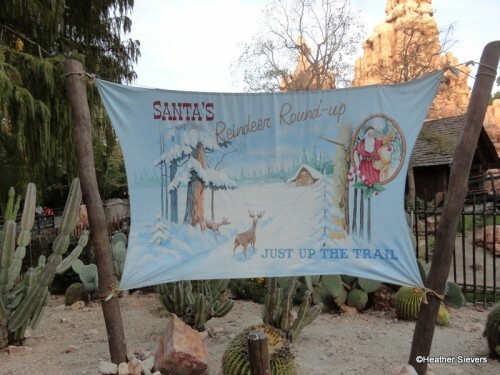 His lovely cabin in Big Thunder Ranch is the perfect escape from the harsh winter back home. He even brings along Mrs. Claus and his reindeer too! Santa's Just Around the Corner! 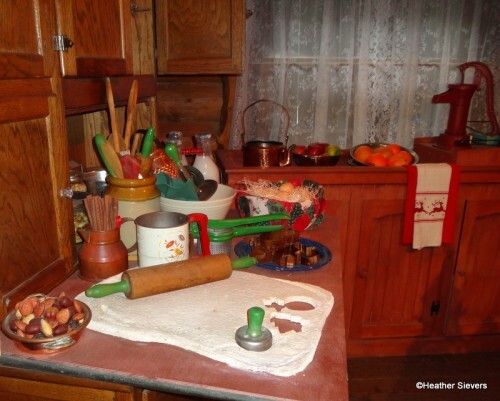 Santa is one lucky guy, because Mrs. Claus has been busy in the cabin’s kitchen. 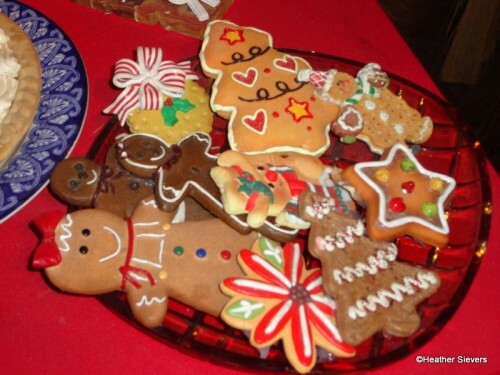 All of these yummy goodies are waiting for him when he’s done listening to Christmas wishes. 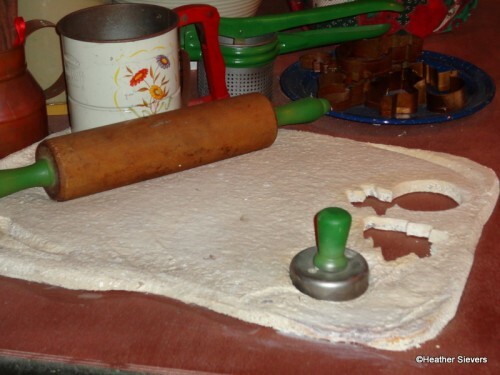 That dough looks good enough to eat!! 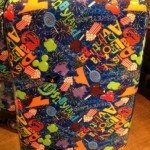 Check out a close up! 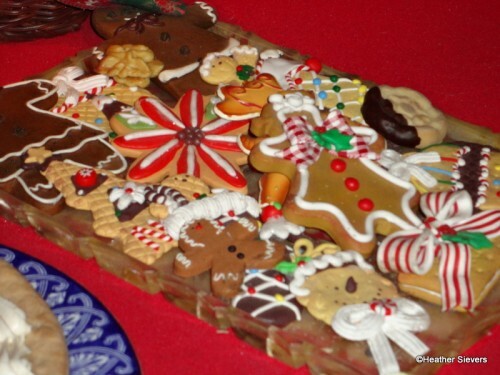 A plate of fun cookies! 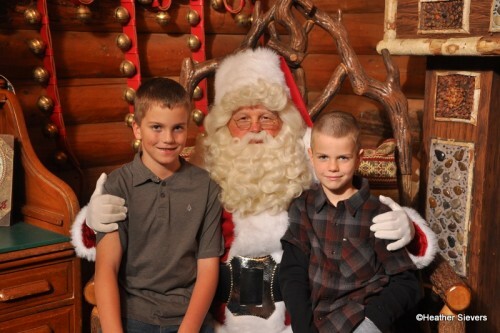 My Boys with the Big Man: I'm enforcing this tradition for at least 18 years! 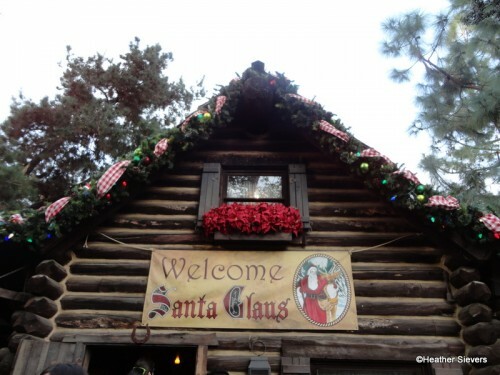 Have you visited Santa at his cabin in Big Thunder Ranch? Did you run into Mrs. Claus while you were there? 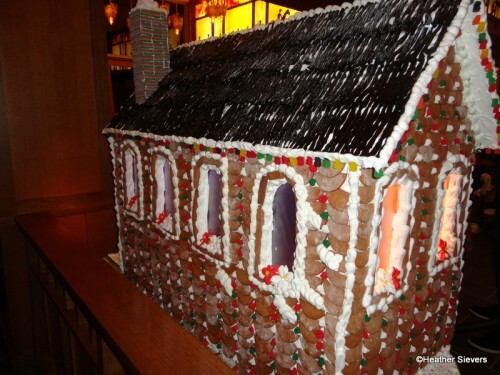 Now that we’ve shared a cabin full of goodies with you, it’s time to check out a house MADE of goodies! 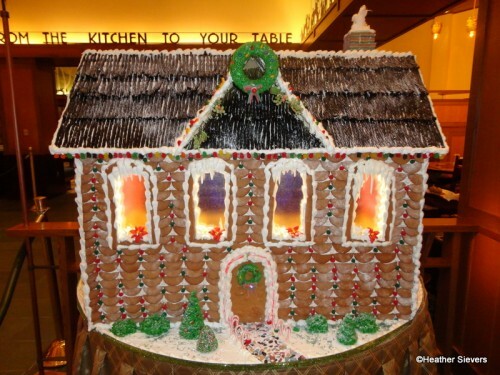 Located in the “lobby” of the Storytellers Cafe at the Grand Californian Hotel is the only giant gingerbread house (other than the one in the Haunted Mansion ballroom) at the Disneyland Resort. 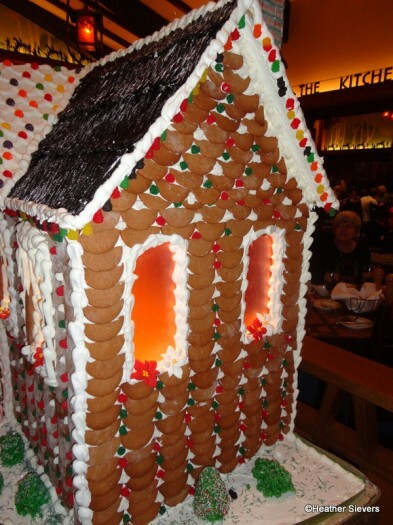 I know, I know, there are gingerbread houses aplenty at the Disney World Resort Hotels, and they are amazing; but I’m still proud of our cute gingerbread house here in Anaheim! The house sits on a large round table to the left as you pass through the restaurant’s lobby, and it smells delicious! 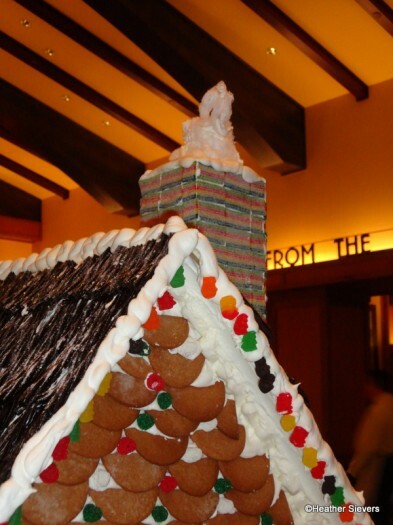 The house features gingerbread wafer siding with red & green nonpareil covered gum drops. 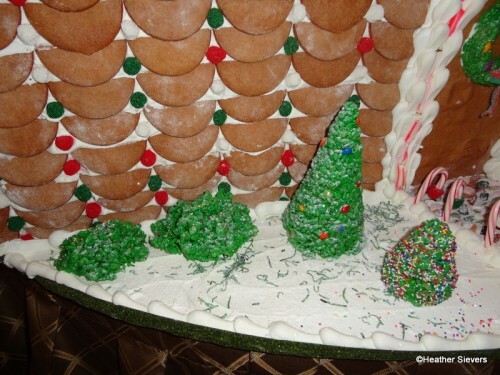 Cute green rice krispie treat wreaths hang from the front door and roof while matching trees and bushes can be seen in the front yard. The colorful decorations on the “greenery” appear to be chocolate-covered colored sunflower seeds and sprinkles of rainbow nonpareils. 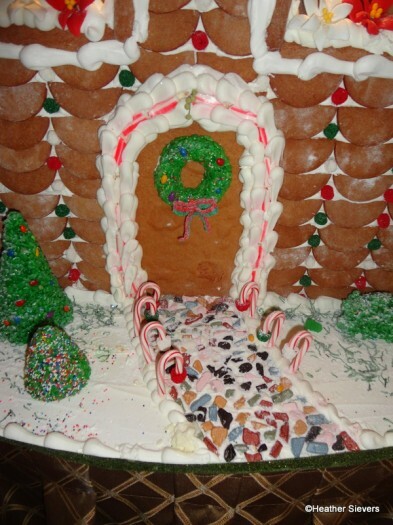 The candy rock pathway leading to the door is lined with mini candy canes, and the windows are adorned with sugar poinsettia flowers. 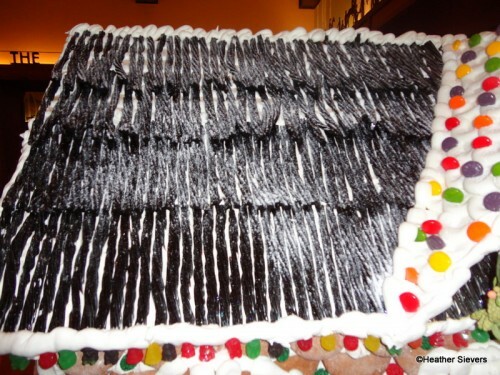 I love the idea of gummy bear “Christmas lights,” and this is the first time I’ve ever seen a black licorice roof on a gingerbread house. 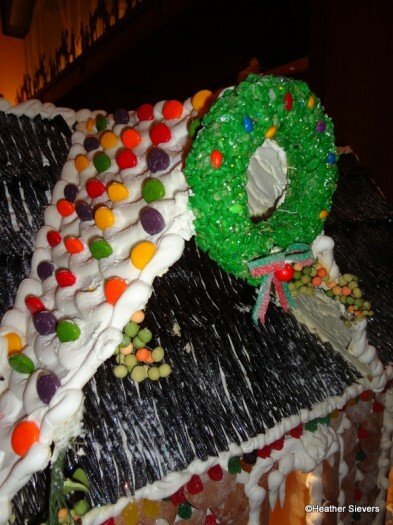 The peak of the roof is decorated with Spree Candies and the chimney is lined with Airheads Xtreme Sour Belts. 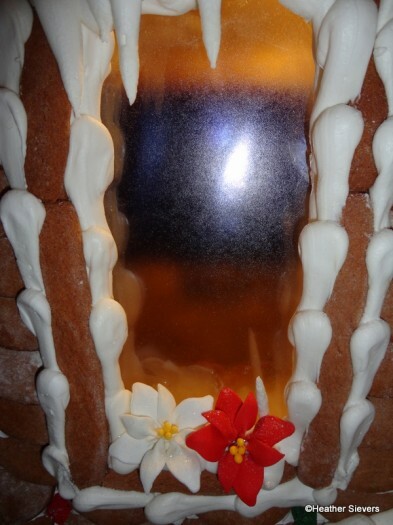 Another fun feature of the Storytellers Gingerbread House? Its inside is lit and the windows are colored in purple, yellow & orange. The light glows softly inside giving it a stained glass window effect. 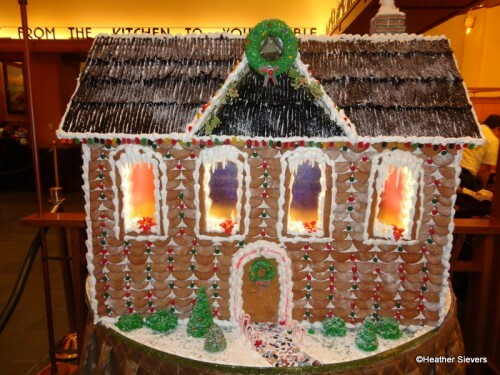 The gingerbread house will remain at Storytellers Cafe through the holiday season at the Disneyland Resort. 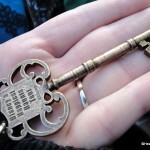 My family actually stumbled across it on accident when we decided to make a spontaneous trip over for dinner last week. Such a fun surprise! 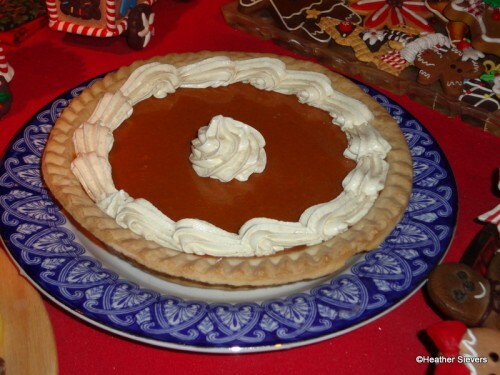 I still have some qualms about using food for things like gingerbread houses ( or chocolate or other food items ) that will eventually be discarded. However it is very clever and well detailed. 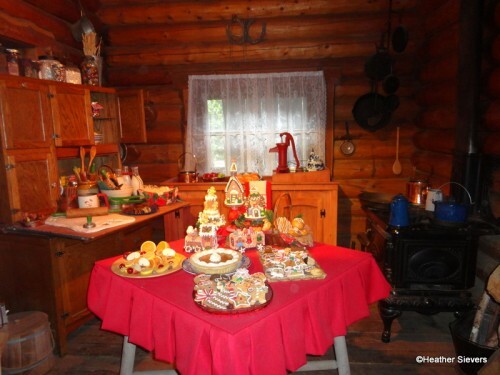 The cabin scene is so homey and full of Christmas warmth it brings me back to my childhood images of the holidays. 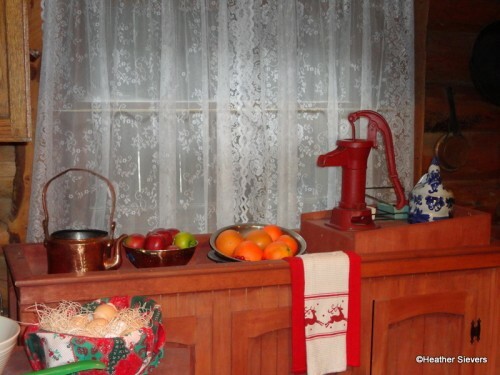 DO YOU THINK THEY USED THOSE FRUIT SOAPS FOR THE FRUIT PLATE IN THE CABIN? @Alan – I love the cabin scene, you wouldn’t believe how many people thought everything was real. @Alissa – Cracking up about this, love that you referenced the fruit soaps!!! 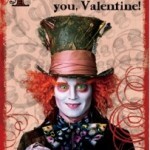 HAHA!!! I love the cabin for Santa and all the honey touches he has there. 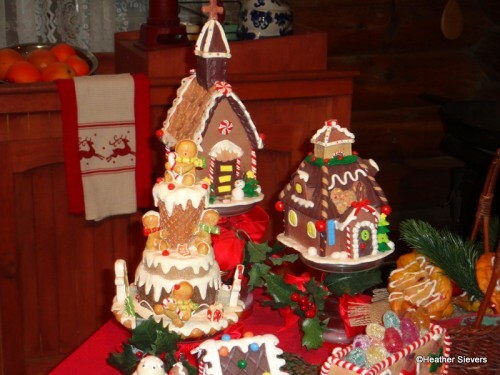 I love gingerbread houses, I’m glad that Disneyland gets into the gingerbread spirit, too! 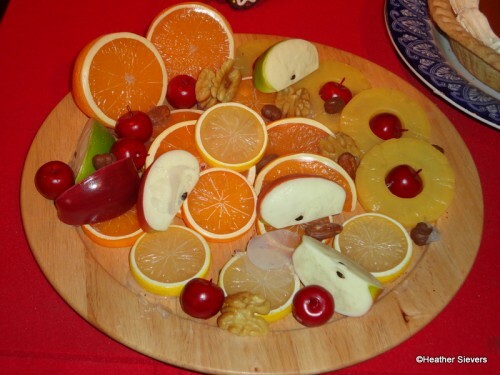 I’d have to see it in person, but the photo of the Fruit and Nut Platter looks like there might be a hidden Mickey in profile in the upper left. The placement of the cherry and apple look odd and when seen with the orange halves it looks like the start of a profile. Hmm, I’d really need to see if from another angle–but what you do you think?